A good Sunday roast is an easy thing for any establishment to say they deliver, but often in reality can be a disappointment and leave a diner unsatisfied!! 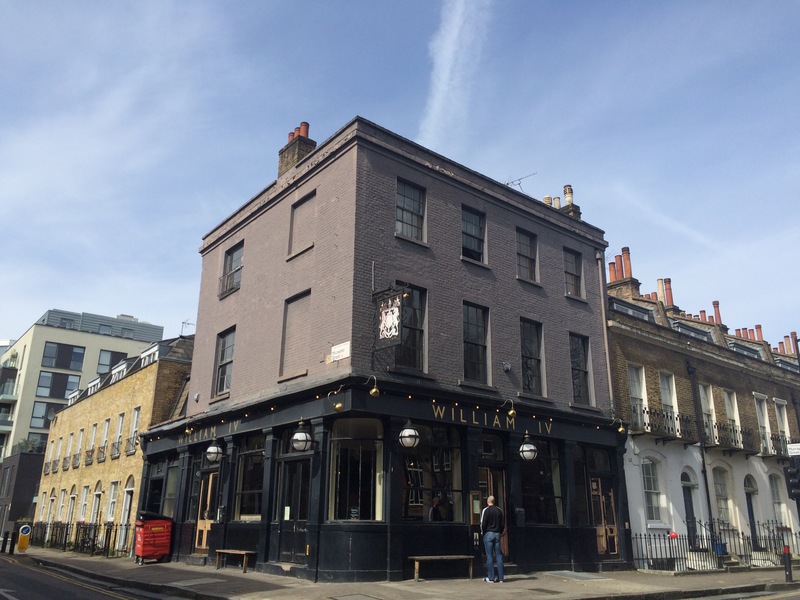 So a little while back we tried out lunch at the William IV pub in hipster Shoreditch – our friends said it did a fine one and I was eager to find out if it lived up to the hype. The William IV’s a nicely laid out pub, benefiting from a position on the corner of two roads, lots of windows keep the space bright and welcoming. A round of punchy Bloody Mary’s started lunch for some of us – birthday celebrations the day before being the cheeky culprit! 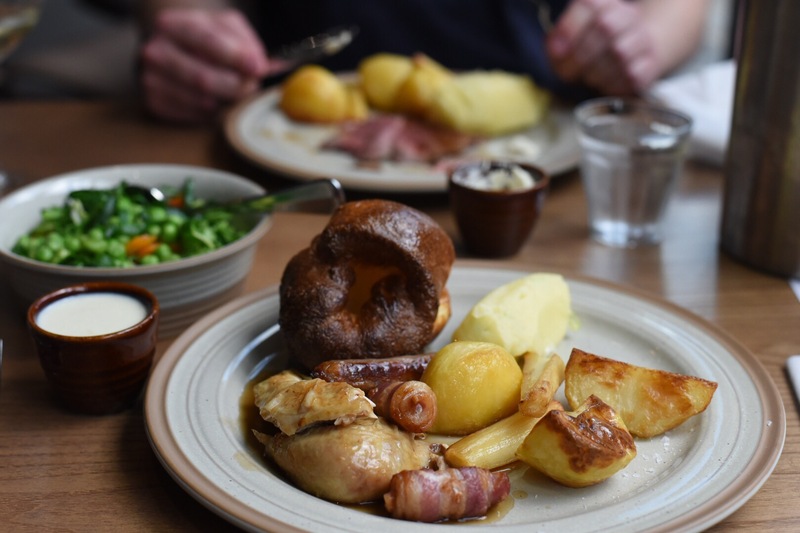 Sunday lunch offerings are short, but sweet – a couple of starters, roasts that cover all the main bases, a few sharing options and desserts to get your teeth into. Whilst most of us eyed up the roasts, the other half was diverted off course and went for two sharing boards!! Oh, don’t worry this isn’t so much of a surprise to me, there are plenty of tales which have become folklore amongst our uni mates, where he’d order everything for himself because he couldn’t decide – the chip shop story has become stuff of legend, even finding a way into our mates wedding speech. 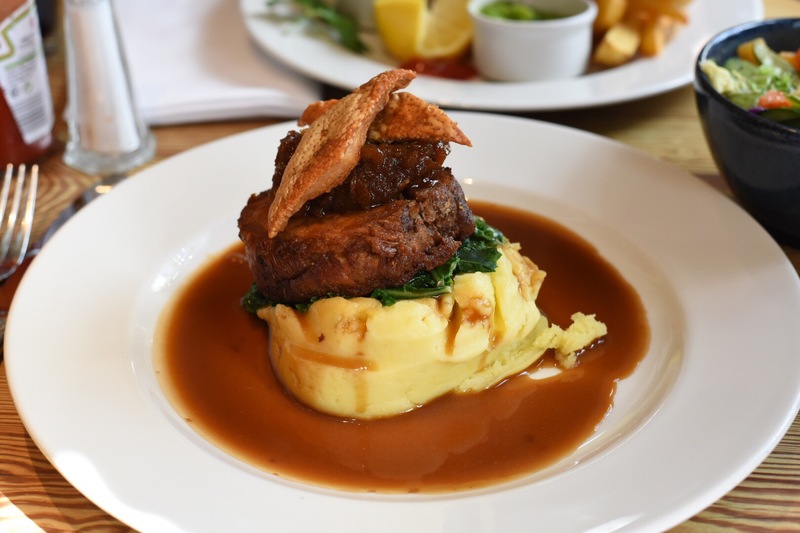 After a bit of a mess up with the order – my original choice being the sirloin of beef, I was brought chicken, however after clocking my eyes on the bird I was pleasantly surprised. Normally I’d get a bit irritated with a messed up order, but he was very apologetic and looked a little mortified at giving me it, saying he would happily bring out the beef. My verdict on the roast – it’s a cracking one on all counts; my plate had a generous amount of moist and juicy roast chicken, coming with crispy skin and lots of herbs. The greens still had bite, it’s iron-packed goodness still intact, and the all-important Yorkshire was crisp, light and a good size. The essentials like decent roast potatoes and veg were treated simply and cooked well, then finally to complete the plate a gravy boat full of the good stuff finishing the roasts off perfectly. 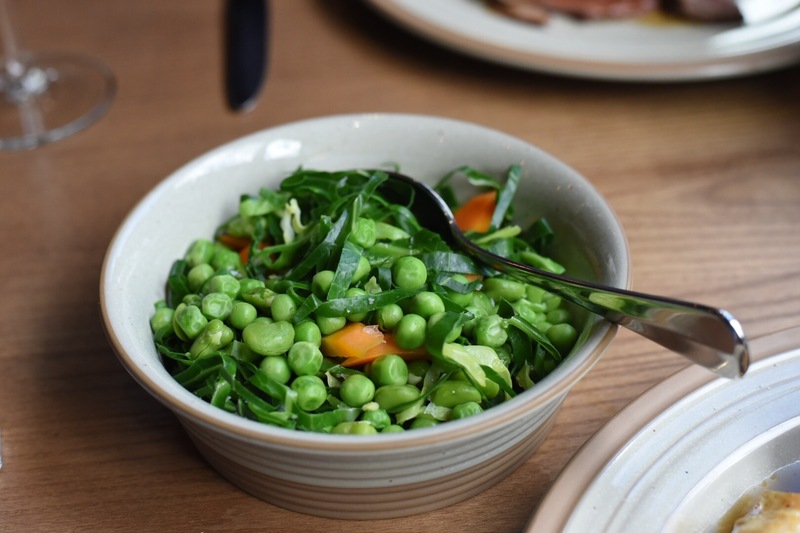 Roasts aside, the asparagus and sharing plates can be commended too – eggs poached to perfection, meat and cheese boards meeting the needs of the other half who worked his way steadily through both very satisfactorily! 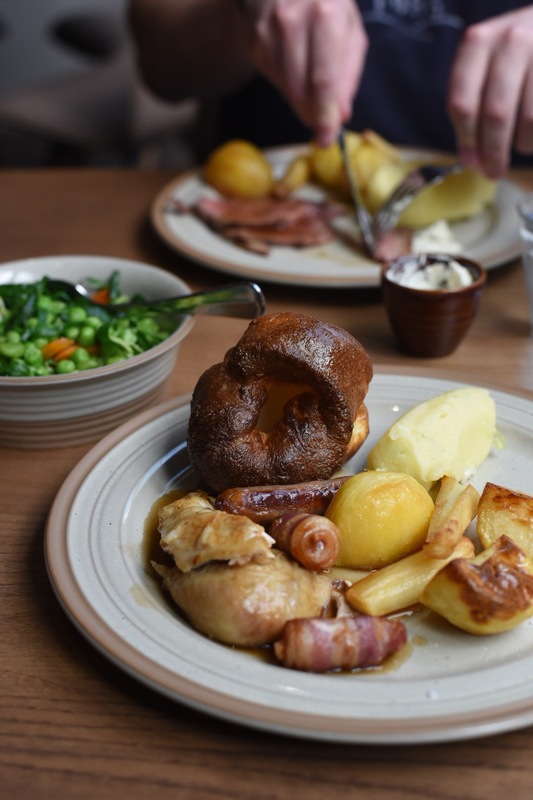 Whether it’s the best Sunday roast in Shoreditch is yet to be seen, but what I can say is it’s a damn tasty one! William IV is a lovely neighbourhood pub and I can see why my friends love it there!! Sunday morning after an all day session the day before found us sprightly and raring for Sunday lunch somewhere. None of us could really be bothered wandering too far, so The Eagle pub at the end of the road was put forward as an option. Well known in the local area, the Victorian boozer can boast having its name in the Pop Goes The Weasel nursery rhyme, and brings with it old school charm and a rough around the edges feel. It wasn’t busy, pretty empty in fact considering it was prime time Sunday lunch, making me think from the off that we may’ve been better going elsewhere. 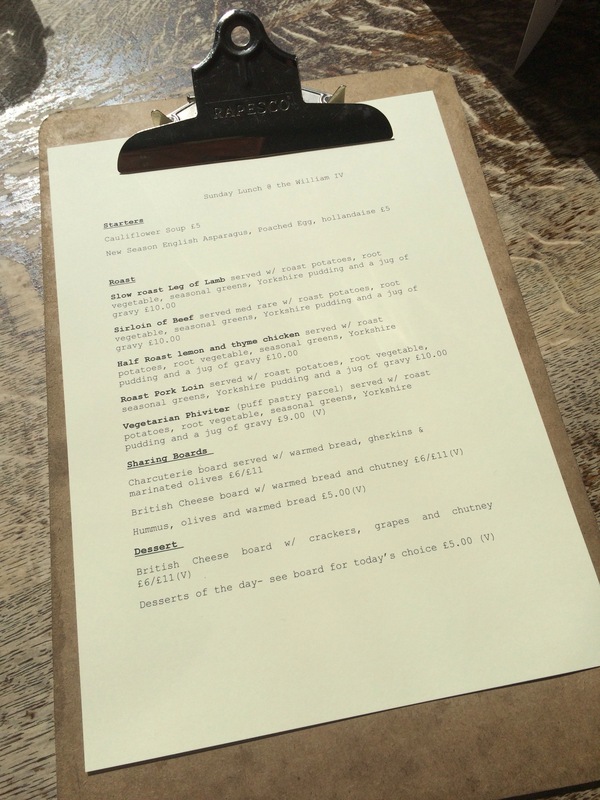 I found their menu a tad confusing; there were Sunday roasts, boards of charcuterie, salads and then a mix of small plates ranging from Poutine, sprats and padron peppers. This initial confusion stopped me in my tracks for a few minutes, and for a while I’d contemplated getting a selection of small plates, but thought better of it and went for a classic fish and chips. The aforementioned fish and chips were good; fish came with a light crisp, golden batter, and regardless of my view that chippy chips are the best, these did the job. Even the mushy peas which were more akin to crushed peas were decent, and I don’t even like them normally. Poutine was good – made with compulsory rich and creamy curds, furthermore, they hadn’t drowned the chips in a sea of gravy; always a plus in my book. The roasts themselves looked just ok, but that’s about it really. Whilst the other half heartily tucked into the meat, he gifted me the Yorkshire which I found disappointingly dry and should’ve been a lot better. The veg was just above average, the parsnips in particular looked anaemic, underdone and were hard to cut, the roast potatoes were better and slightly, just slightly made up for them. 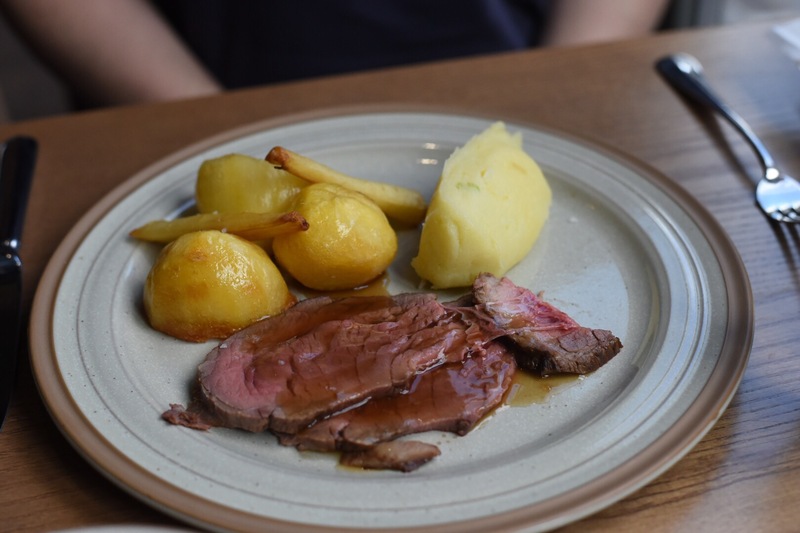 Overall, the place has a homely feel and I was happy with parts of the meal – the poutine and fish and chips were great, but if you’re after a Sunday roast I’m sure there are better places locally. The last few weeks I’ve been slowly settling into my new surroundings and still on the hunt for great places to eat. At the moment Sunday mornings are spent either at the gym (other half), or running like a lunatic around the park trying my best to concentrate and stay on two feet, especially as the Berlin marathon is just over three weeks away!! I’ve got a healthy appetite at the best of times, so you can imagine after running for a few hours the need for something filling, hearty and tasty. 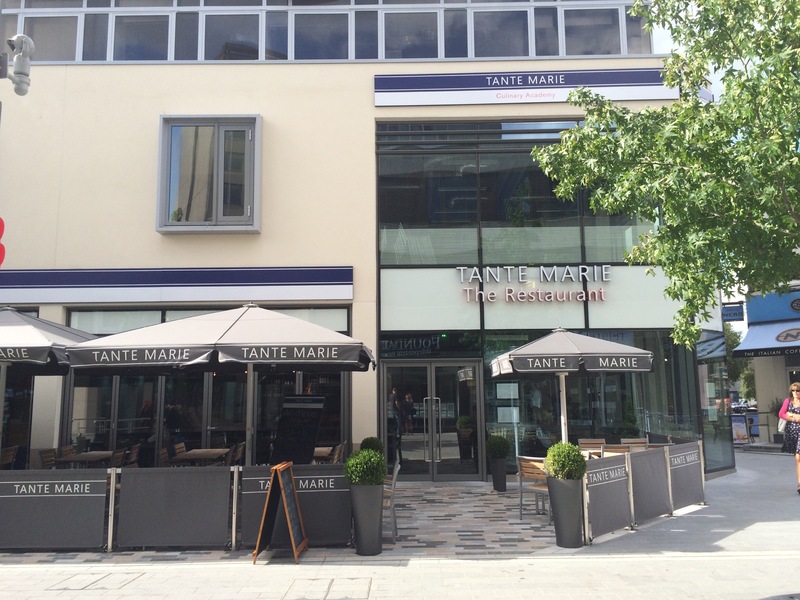 Located on Woking’s pedestrianised high street is Tante Marie Restaurant, in these parts the establishment is known for its culinary school status – the oldest independent cookery school in the country no less, but a few months ago it opened a restaurant to show off some of the talent it nurtures. The restaurants dining room is decked out in an informal yet stylish manner with smart wooden tables, comfy leather backed chairs and cool industrial style lighting – definitely a nice place to spend a few hours in. 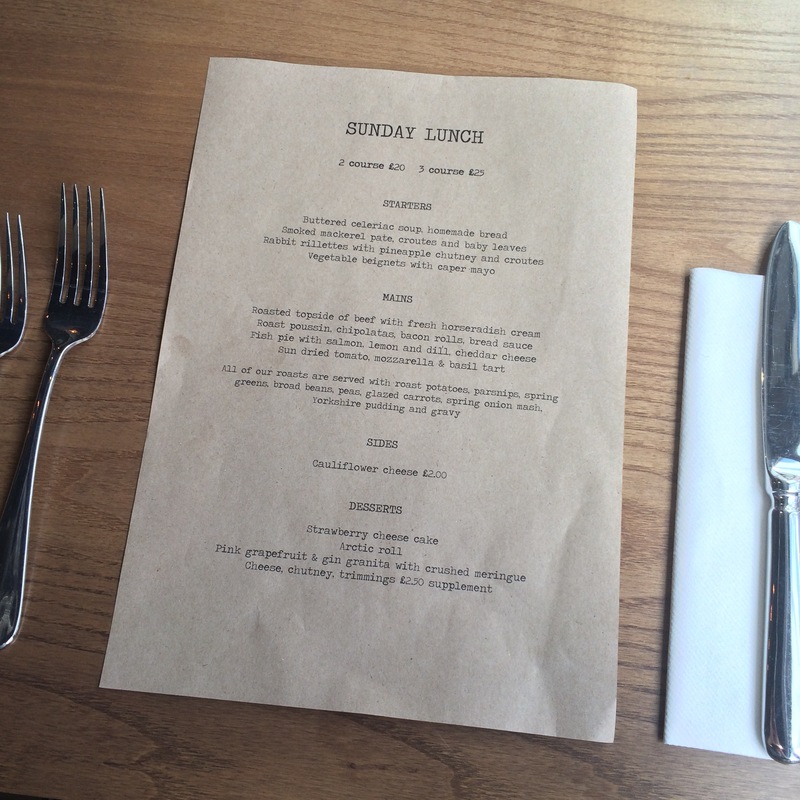 On Sundays there’s a set menu with two courses (£20) or three courses (£25) and as gluten free choices are important for the other half, we quickly checked with the kitchen what options were available. Fortunately there was good news with most dishes being GF or could be adapted to suit, so both of us went for two courses, surprisingly I went for a main course and dessert finding the idea of pink grapefruit and gin granita too irresistible. 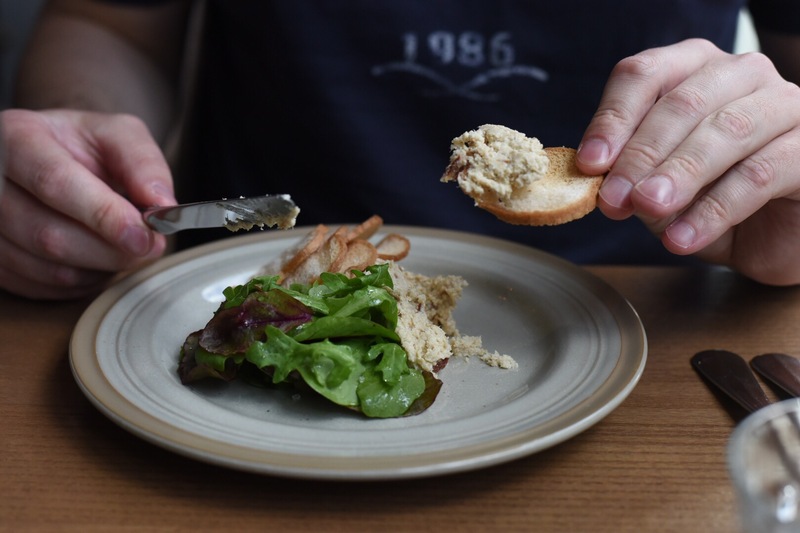 Rabbit rillettes with gluten free croutes and salad started the lunch off well, the rillette still had substance and the rabbit came through subtly. The bread was a pleasant surprise and actually had the taste and texture of bread, unlike most we’ve tried which have been really tasteless and very un-breadlike! 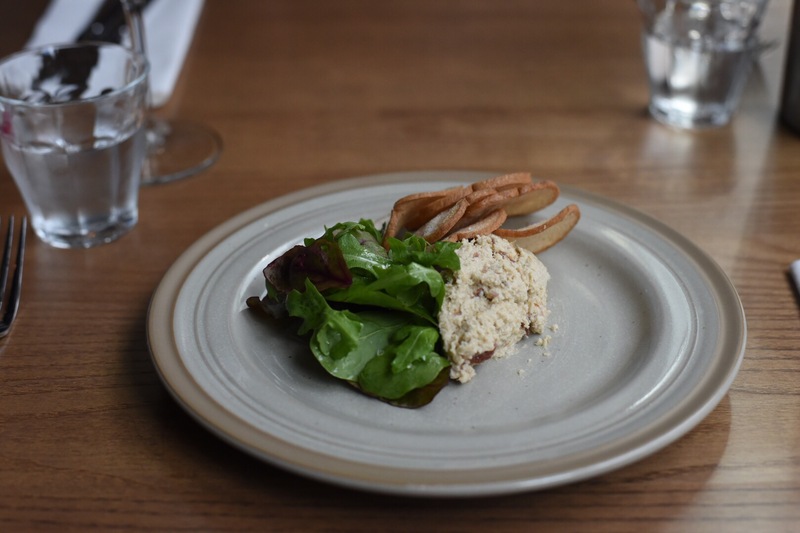 The rillette was an unexpected choice as pineapple is one the other half’s food hates, however it went well with the rabbit and helped cut through any richness, without masking its delicate flavour. As far as roasts go the meat on both plates was beautifully cooked, portions were a little stingy though – just two slices of beef and a breast and a leg from a poussin, so hardly the largest of birds. Maybe I’m doing them a disservice as far as my plate goes as there was also some bacon and a chipolata alongside the chicken. 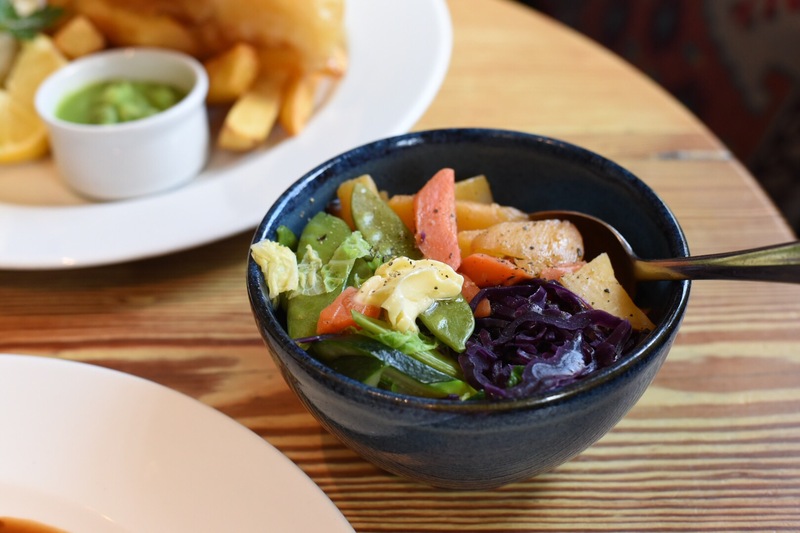 The extras did their best to make up for it with a summery bowl of veg, roasties, mash, parsnips and the Yorkshire that were all done well. I’m a gravy lover, so there definitely could’ve been more and a gravy boat on the side would’ve pleased both the haters and gravy lovers amongst us. The bread sauce was fine and the horseradish cream needed more punch, it was far too polite and deserved a whack more heat! The Yorkshire was crisp and light, not the biggest but it did the trick, I always feel sorry for my husband as he has to go without and his roast dinner ends up looking a little lonely without one. In hindsight I wish I’d been quicker off the mark and suggested having his on my plate instead, considering it was still being paid for. Roast poussin with bacon rolls, chipolata, spring onion mash, roast potatoes, parsnips, bread sauce, greens and Yorkshire pudding. 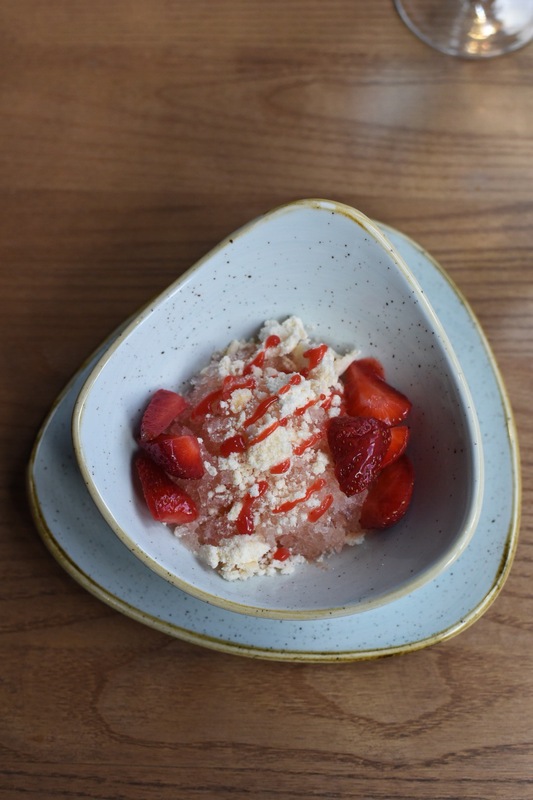 I was determined to finish lunch off with the granita that’d caught my eye early on and my decision was fully justified – absolutely no negatives with the dessert, I loved it! For someone who’s not really a fan of heavy puddings this was perfect – refreshingly sharp with pink grapefruit balanced by the sugary meringue, the cheeky hit of gin making it even better still. 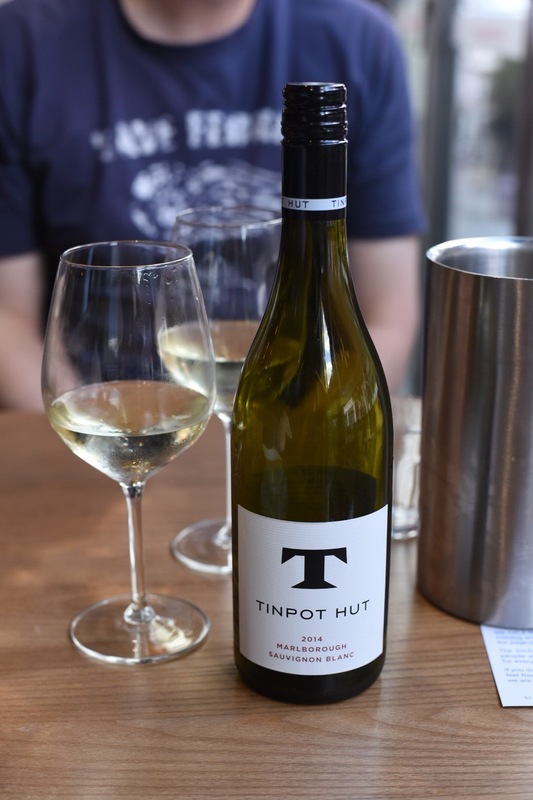 Overall, I really liked Tante Marie – there’s a good standard of cooking and waiting times are reasonable. The space is modern, formal without feeling stuffy and the staff are friendly and helpful. I’m sure it won’t be the last time I visit, I just hope they’re more generous with the meat on a roast and have a bit more punch to some of the additional extras. I was absolutely starving last Sunday afternoon, you may think it’s because I hadn’t eaten anything, but wasn’t the case. I’d wolfed down a full breakfast earlier that morning, but that was filling the space created from a 12 mile run, my last long run before Sunday’s Hackney half marathon. 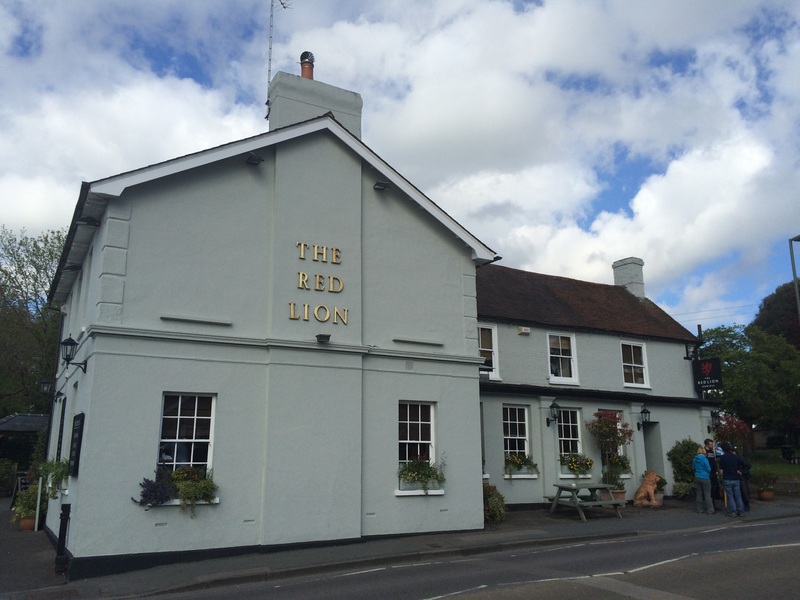 By 2pm I was ravenous again, having remembered a good pub my brother in-law had mentioned called the Red Lion, we rang up and quickly reserved a table one of the few free tables. 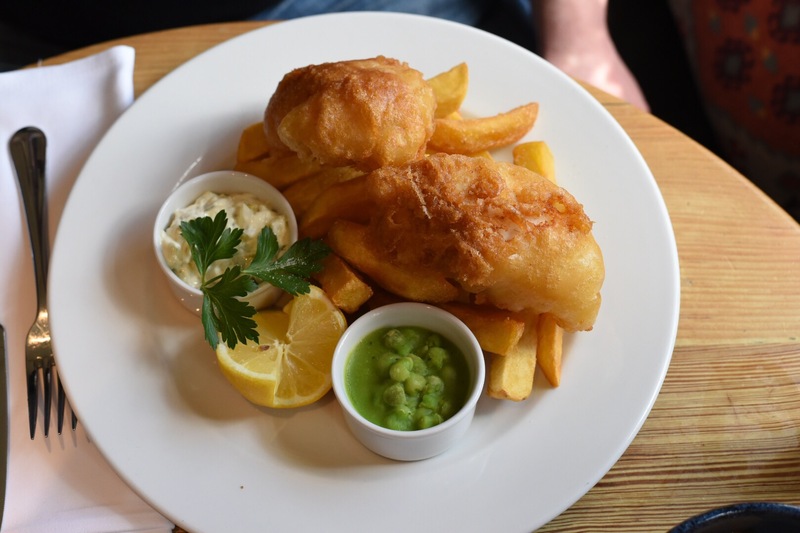 This gastropub is found in Horsell, a small village in Woking. It’s an area that I’m still getting to know, but from what I could see was it’s a pretty part of the world. The pub certainly takes a prominent position in the village and was well positioned with a beer garden and a decent amount of parking. 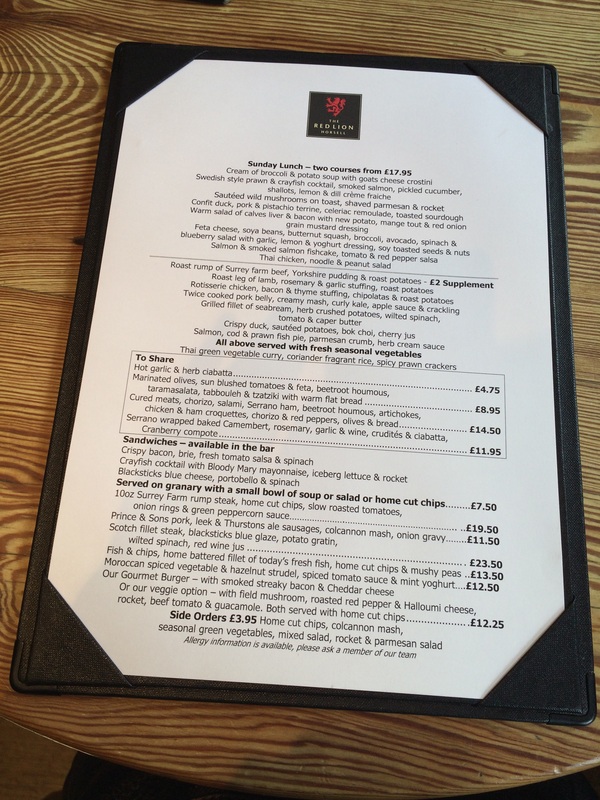 On first appearances it was a good looking gastropub, nicely furnished and welcoming. The sort of place where I’d be happy to spend time in; whether it be after work drinks, a smart lunch or as we were – a good Sunday lunch. Even though the day had started with a downpour, it soon cleared, the sun came out, bringing out the locals so the pub was pretty rammed. 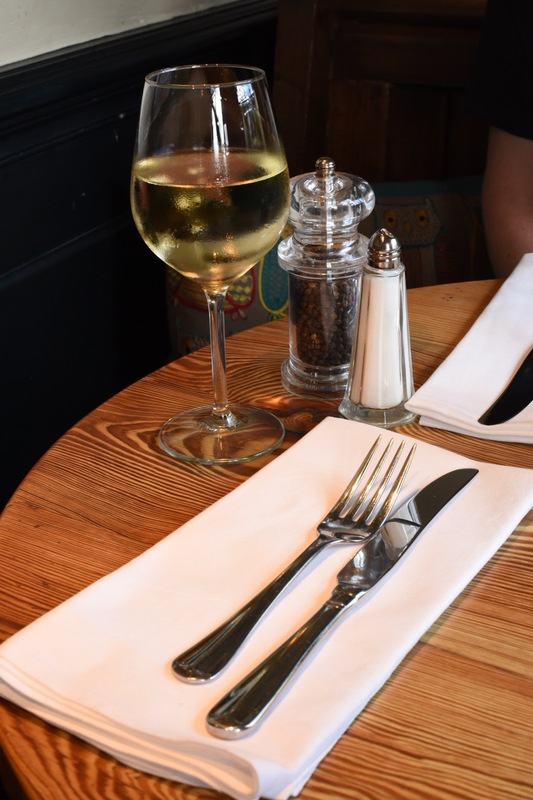 Menu-wise, on Sunday’s they offer dishes catering for a range of appetites, such as sandwiches, larger plates like steak, fish and chips, burgers, but also a two-course Sunday lunch for £17.95. Strategically placed at the top of the menu, it was the first thing I saw and I fell for it straightaway. My husband on the other hand had looked at the whole menu and picked fish and chips. It was a busy Sunday and the kitchen was certainly bringing out dishes a plenty. 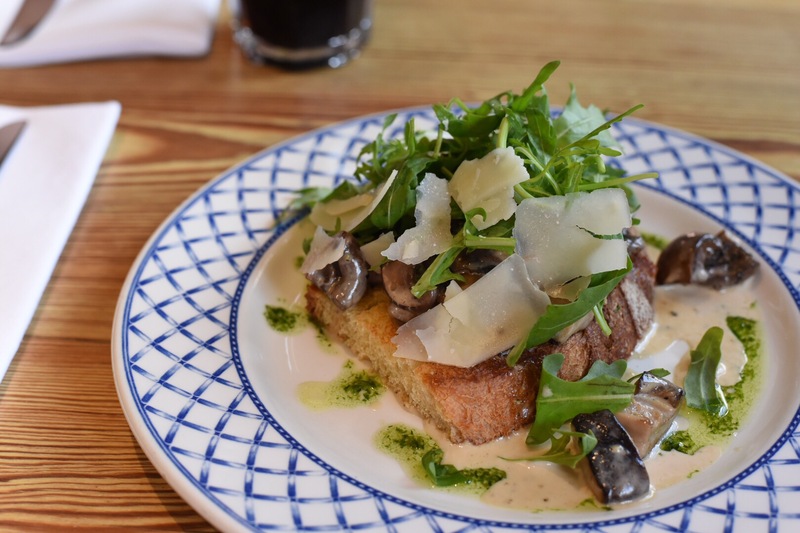 My starter of mushrooms on toast was a pretty looking plate, ingredients were treated simply and allowed to shine – woody mushrooms, peppery rocket, salty parmesan with a herby dressing on toasted bread really hit the mark. A little later, we were brought the main courses; i’d immediately picked the twice cooked pork belly, from a list of dishes where a number of others could’ve been chosen. However, I seem to have an affinity for pork belly that the others just don’t match for whatever reason. It was a hearty portion to say the least! A large base of smooth mash was topped with lots of metallic kale to counteract the porky sweetness, then plenty of apple chutney and a glossy gravy helped bring it altogether. The meat was cooked well, still juicy and the crackling was a bit of alright too. I just would have loved more of it, but I properly love crackling!! I very nearly forgot the veg, probably enough for two, it still had a touch of bite and had lots of choice with carrots, red cabbage, sugar snap peas…..
No complaints opposite me either for the fish and chips – mushy peas were mushy, tartare sauce was sharp enough, the fish tasted great and the chips were crisp and golden. There was just too many chips, but hey, that’s not really a fault, I’d rather too much than too little!! If I’d arrived hungry, I certainly wasn’t by the time I left! The Red Lion’s a lovely spot for Sunday lunch if you’re ever in the area. Definitely one to remember for next time.